TGF-β signaling regulates diverse cellular processes, including cell proliferation, differentiation, apoptosis, cell plasticity and migration. Its dysfunctions can result in various kinds of diseases, such as cancer and tissue fibrosis. TGF-β signaling is tightly regulated at different levels along the pathway, and modulation of TGF-β receptor activity is a critical step for signaling regulation. This review focuses on our recent understanding of regulation of TGF-β receptor activity. Transforming growth factor-β (TGF-β) family, including TGF-β, activin, Nodal, bone morphogenetic proteins (BMPs) and others, play vital roles in development, tissue homeostasis and some diseases development [1–3]. TGF-β signaling is initiated by the binding of TGF-β to its serine and threonine kinase receptors, the type II (TβRII) and type I (TβRI) receptors on the cell membrane. Ligand binding leads to formation of the receptor heterocomplex, in which TβRII phosphorylates threonine and serine residues in the TTSGSGSG motif of TβRI and thus activates TβRI [2, 4]. The activated TβRI recruits and phosphorylates the R-Smad proteins, Smad2/3 for TGF-β and activin signaling while Smad1/5/8 for BMP signaling, which then form a heterocomplex with the Co-Smad Smad4 [5, 6]. The Smad complexes are then translocated into the nucleus to regulate transcription of the target genes in cooperation with other co-factors [5, 7, 8]. For each member of the TGF-β family, they have their own type I and type II receptors. Among the seven type I receptors, which are also called as activin receptor-like kinases (ALKs), TβRI/ALK5 can mediate TGF-β signaling with the TGF-β type II receptor TβRII to activate Smad2/3 in universal cell types, while in endothelial cells ALK1 functions with TβRII to activate Smad1/5/8 for TGF-β signaling [8–10]. In response to BMPs, ALK2/3/6 can activate Smad1/5/8 with the type II receptors BMPRII, ActRII and ActRIIB [11, 12]. ALK4/7 can activate Smad2/3 with ActRII and ActRIIB to mediate activin/Nodal signaling . In this review, we mainly discuss the regulation mechanisms of TGF-β signaling receptors. In addition to activating Smad2/3, TGF-β can also activate mitogen-activating protein kinases (MAPKs) (ERK, p38 and JNK), phosphatidylinositol 3 kinase (PI3K)/Akt and small GTPases in a context-dependent manner [14–17]. Furthermore, despite the fact that TGF-β can activate Smad1/5/8 in endothelial cells which requires ALK1 [18, 19], it can also activate Smad1/5/8 in other types of cells that is facilitated by the BMP type I receptors ALK2/3/6 or by other unclear mechanisms [20–22]. Those Smads are previously regarded solely as the substrates of BMP receptors to mediate BMP signaling. As modulation of the receptor activity is important for TGF-β signaling, much attention has been paid to this issue. This topic has been covered in many excellent review articles, including the one by Kang et al . The current article attempts to summarize the recent development of our understanding on TGF-β receptor activity regulation. Despite the fact that they are protein kinases themselves, TGF-β receptors also function as substrates for phosphorylation to regulate their activity  (Figure 1). TβRII are constitutively active and can undergo autophosphorylation. Ser213 and Ser409 phosphorylation are essential for TβRII's kinase activity while Ser416 phosphorylation has the inhibitory effect . TβRI activation requires the phosphorylation in its GS domain (TTSGSGSG) by TβRII, and mutation of two or more residues in this motif impairs TβRI kinase activity and further disrupts expression of a Smad-dependent reporter . For still unknown mechanisms, however, substitution of the non-phosphorylation residue Thr204 by aspartic acid leads to partial activation independent of ligands . The residue Ser165 of TβRI can also be phosphorylated upon ligands stimulation . Interestingly, substitution of Ser165 with alanine, glutamic acid or aspartic acid has no effect on TGF-β-induced reporter expression, but increases TGF-β-mediated growth inhibition and extracellular matrix formation and decreases TGF-β-induced apoptosis . The same study has also identified several other phosphoserine residues, but the functional significance of these phosphorylations is unclear . TGF-β receptors are thought to possess both Ser/The kinase activity and Tyr kinase activity. Indeed, TβRII has been reported to be autophosphorylated on Tyr259, Tyr336 and Tyr424, and mutation of these three residues strongly inhibits its kinase activity . Phosphorylation of TGF-β receptors. Phosphorylation of TGF-β receptors regulates their activity and thus downstream Smad-dependent signaling. Phosphorylation is a reversible process. PP1c, a catalytic subunit of the protein phosphatase 1 (PP1) was reported to dephosphorylate TβRI  (Figure 1). TGF-β promotes the ternary complex formation of the PP1 regulatory subunit GADD34, Smad7 and TβRI, thus leading to the recruitment of PP1c via Smad7-GADD34 to the receptor complexes. PP1-mediated dephosphorylation of TβRI serves as a negative feedback mechanism to downregulate TGF-β signaling. TβRI can also be dephosphorylated by the protein phosphatase PP2A . Interestingly, Bα (PPP2R2A) and Bδ (PPP2R2D), two regulatory subunits of PP2A have been shown to have opposite functions in regulation of signaling mediated by TGF-β as well as other TGF-β family members, activin and Nodal. Bα stabilizes the type I receptors of TGF-β and activin/Nodal, while Bδ inhibits receptor kinase activity for unclear mechanisms . In analogy to TβRI, it is reasonable to assume that TβRII can also undergo dephosphorylation. However, the responsible phosphatases have not been reported yet. TGF-β receptors can undergo ubiquitination-mediated degradation [30, 31]. In addition to requirement of the conventional ubiquitination system containing ubiquitin E1, E2 and E3 ligases, ubiquitination of TβRI appears to need an adaptor protein, Smad7 . Smad7, a member of the I-Smads, can interact with the activated TβRI and recruit the HECT domain-containing E3 ligases Smurf1, Smurf2, NEDD4-2, or WWP1 to the receptor, leading to ubiquitination and degradation of the receptor [33–37] (Figure 2). Degradation of TGF-β receptors. TGF-β receptors can be degraded through both ubiquitination-dependent and -independent ways. After ubiquitination, both TGF-β type I (TβRI) and type II (TβRII) receptors can be degraded via proteasome or lysosome. Although it is unclear how TβRII ubiquitination/degradation is regulated, Smad7 and Dapper2 are important adaptor proteins for ubiquitin E3 ligases (indicated in the green box)-mediated TβRI ubiquitination and degradation. Smad7-mediated ubiquitination/degradation of TβRI is finely controlled by Smad7-binding proteins indicated in the pink box. Ubiquitination of TβRI is finely controlled by multiple proteins and mechanisms. The Salt-inducible kinase (SIK) has been reported to promote Smad7-TβRI complex formation and enhance the ubiquitination-dependent degradation of TβRI . In addition, SIK is a direct transcriptional target of TGF-β signaling, and therefore it functions as a negative regulating feedback mechanism to limit TGF-β signaling . Atrophin1-interacting protein 4 (AIP4) and Yes-associated protein 65 (YAP65) have been shown to enhance recruitment of Smad7 to TβRI and thus inhibit TGF-β signaling [39, 40]. In contrast, several other proteins have been demonstrated to inhibit the Smad7-dependent ubiquitination of TβRI. The 90-kDa heat-shock protein (HSP90) interacts with both TβRI and TβRII, and inhibition of HSP90 activity increases Smad7/Smurf2-dependent ubiquitination of TβRI and decreases TGF-β-induced signaling . TGF-β-stimulated clone 22 (TSC-22) can disrupt the binding of Smad7/Smurfs to TβRI and therefore decrease the ubiquitination and degradation of the receptor, resulting in enhanced TGF-β signaling . Regulation of ubiquitination-dependent degradation of the receptors is an important aspect in termination of TGF-β signal transduction. It seems that TGF-β receptors can be degraded in both the proteasome and lysosome pathways, and the lysosomal degradation may not always require ubiquitinaiton. For instance, Dapper2 can interact with TβRI in the Rab7-positive late endosomes and facilitate its transport to lysosomes for degradation [43, 44]. It is unclear whether Smad7 and ubiquitination play any roles in this process (Figure 2). Sorting nexin 25 (SNX25) has been reported to enhance TβRI degradation in lysosomes independent of ubiquitination . Although the regulation of TβRI degradation has caught reasonable attention, how TβRII degradation is regulated is less studied. The tetrameric complex formation between TβRI and TβRII is essential for TGF-β signal transduction . It has long been regarded that both TβRI and TβRII exist as a pre-formed dimer on the plasma membrane and ligands binding promotes the homo-dimer to form a hetero-tetramer [47–49]. However, using single-molecule imaging combined with total internal reflection fluorescence microscopy technology, TGF-β receptors were found to exist as monomers on the membrane in resting cells and undergo dimerization upon TGF-β stimulation [50, 51]. Therefore, regulation of receptor complex formation is an important mechanism to control TGF-β signaling. The TGF-β coreceptor betaglycan facilitates TGF-β signaling by helping presentation of the ligands to TβRII [52–55]. However, in some cell types such as pig kidney LLC-PK1 cells, betaglycan can inhibit TGF-β heteromeric receptor complex formation to negatively regulate the signaling, indicating that betaglycan regulates TGF-β signaling at receptor level in a cell type dependent manner . BMP and activin membrane-bound inhibitor (BAMBI) and the ETV6-NTRK3 chimeric tyrosine kinase have been demonstrated to attenuate TGF-β signaling by interfering with the heterocomplex formation of TGF-β receptors [56–58]. 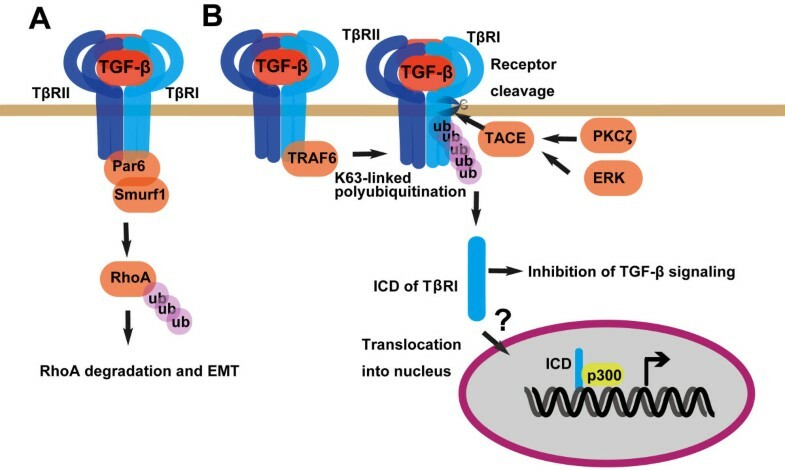 In contrast, the immunophilin FKBP12, which physically binds to the GS domain of TβRI, does not interrupt receptor complex formation, but blocks TβRI activation by TβRII [59–61](Figure 3A). Various mechanisms regulate TGF-β receptor activity. (A) Regulation of TGF-β receptor activity by multiple receptor-binding proteins. BAMBI and ETV6-NTRK3 attenuates TGF-β receptor activity by interfering receptor heterocomplex formation, while FKBP12 blocks GS domain phosphorylation of TβRI by TβRII at the basal state. (B) Sumoylation promotes TβRI activity. After phosphorylated by TβRII at the GS domain, TβRI is activated to interact with and phosphorylate Smad2/3. Various proteins associated with receptors complex have been reported to regulate Smad recruitment, which was already summarized in the review of Kang et al, such as SARA, STRAP and Axin . Here we take SARA as an example. Smad archor for receptor activation protein (SARA), a FYVE domain protein which associates with membrane via binding to phosphatidylinosital-3 phosphate, helps recruitment of Smad2/3 to the activated TβRI to facilitate Smad activation . In addition to affecting receptor complex formation, BAMBI can form a ternary complex with TβRI and Smad7 to disrupt the interactions between TβRI and Smad3 . Post-translational modification of the receptors can also influence Smad recruitment. 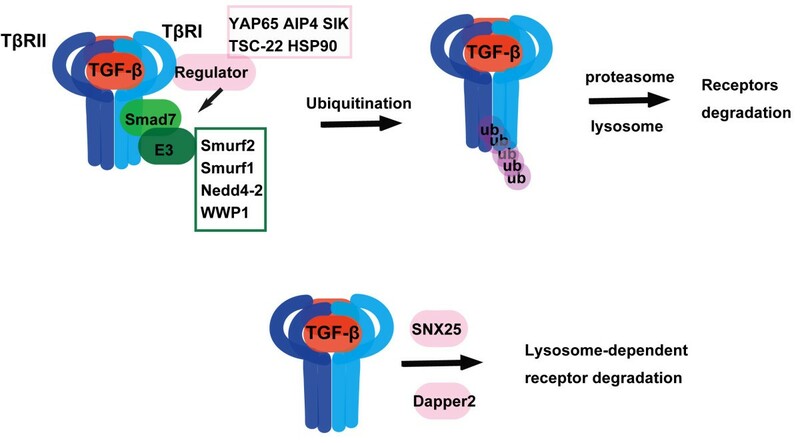 Sumoylation is a ubiquitin-like modification and regulates protein localization and activity . The phosphorylated TβRI can be sumoylated at Lys389 . 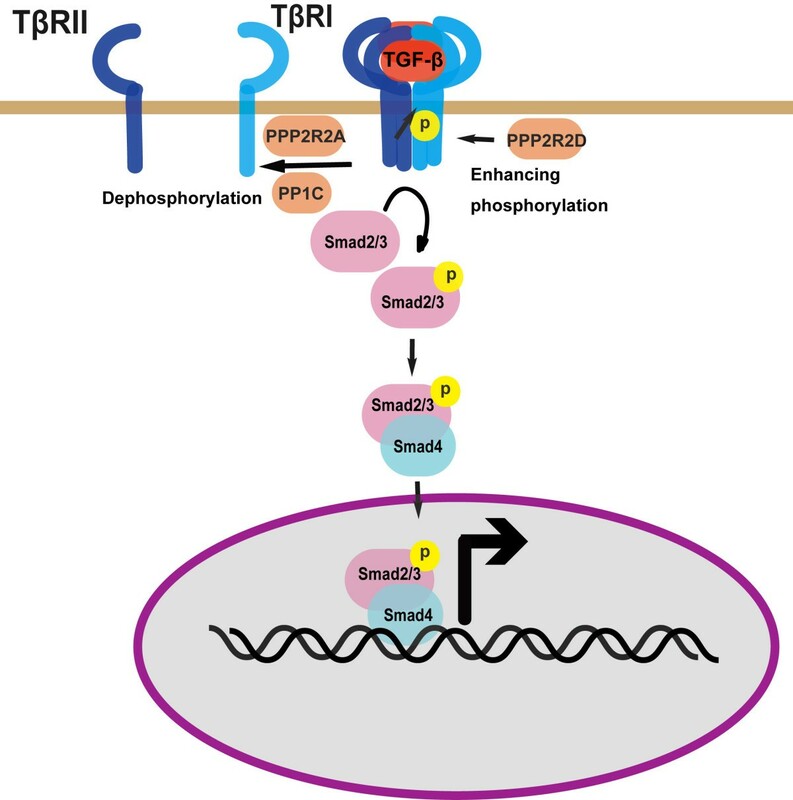 Sumoylation of TβRI can enhance TGF-β signaling by promoting recruitment and phosphorylation of Smad3 (Figure 3B). TGF-β not only transduces its signal via Smad proteins, but can also activate other signaling molecules such as MAPKs in a cell type-specific manner (Figure 4A). Receptor activity is also required for the later event as inhibition of TβRI activity blocks TGF-β-induced MAPK activation . Several studies suggested that TGF-β-mediated MAPK activation is associated with tyrosine phosphorylation of TGF-β receptors. Src was reported to phosphorylate TβRII on Tyr284 and recruit the SH2-containing adaptors Grb2 and Shc to the receptor . This event may play an important role in TGF-β-mediated p38 activation although it has no effect on the canonical Smad2/3 signaling. Like TβRII, TβRI is also a dual-specificity kinase. TGF-β can induce tyrosine phosphorylation of TβRI and then phosphorylation on both tyrosine and serine residues of Shc, leading to recruitment of Grb2 and Sos, a guanine nucleotide exchange factor for Ras, and thus MAPK activation . TβRI was also reported to interact with an E3 ubiquitin ligase TRAF6, which functions to mediate the activation of p38 and JNK by TGF-β [65, 68]. TβRI enhances the K63-linked ubiquitination of TRAF6, leading to the activation of TAK1 and stimulation of p38 and JNK signaling. Roles of TGF-β receptors in activation of MAPKs and Smad1/5/8. In addition to activating Smad2/3, TGF-β can also turn on MAPKs and Smad1/5/8. (A) Activation of MAPKs can be achieved via the TRAF6-TAK1 axis or the Grb2/Shc-Ras axis. (B) In addition to TGF-β receptors, activation of Smad1/5/8 has been shown to be dependent on ALK1 and endoglin in endothelial cells or the BMP type I receptors ALK2/3/6 in other cell types. Smad1/5/8 is usually activated by BMP, but can also be activated by TGF-β [10, 18, 20–22, 69] (Figure 4B). It has been known that TGF-β can activate Smad1/5/8 via its endothelial-specific type I receptor ALK1 in endothelial cells [10, 18]. A recent study reported that TβRI-mediated phosphorylation of endoglin, an endothelial-specific TGF-β coreceptor, is essential for TGF-β activation of Smad1/5/8 in endothelial cells . In other cell types, TGF-β-mediated activation of Smad1/5/8 can be achieved via the interaction of TβRI with BMP receptors ALK2/3/6 , or in BMP receptor-independent mechanisms . Other proteins may be involved in this process. For example, ERBB2, an EGFR family member, has been indicated in Smad1/5/8 activation induced by TGF-β , but the detailed mechanism still need to be defined. As many other cell surface receptors, TGF-β receptors mainly function through activating downstream signaling molecules, such as Smads, MAPKs and Akt in the case of TGF-β. However, it has been found that TGF-β receptors can also transduce signals via atypical manners. For instance, TβRII can interact with and phosphorylate Par6, which recruits the ubiquitin E3 ligase Smurf1 to degrade RhoA, leading to loss of tight junctions and epithelial-mesenchymal transition  (Figure 5A). TGF-β receptors can function independent of downstream signaling molecules Smads, MAPKs or Akt. (A) TβRII can interact with Par6 to induce degradation of RhoA, leading to epithelia-mesenchymal transition. (B) The intracellular domain (ICD) of TβRI can be cleaved by TACE and translocate into the nucleus to regulate transcription associated with p300. A recent report revealed a nuclear function of TβRI . K63-linked polyubiquitination of TβRI by TRAF6 promotes its cleavage at the residue G120 by TNF-α converting enzyme TACE (Figure 5B). The released intracellular domain (TβRI-ICD) enters the nucleus and associates with p300 to regulate the expression of target genes such as Snail and MMP2. TGF-β can activate PKCζ in a TRAF6-dependent manner, and PKCζ in turn facilitates the TACE-mediated cleavage of TβRI. Blockage of the TβRI-ICD releasing attenuates TGF-β-induced invasiveness of breast MDA-MD-231 and lung A549 carcinoma cells. Interestingly, TACE, activated by ERK signaling, induced cleavage of TβRI was also shown to reduce the cell surface receptor amount and negatively regulate TGF-β signaling on anti-proliferation and epithelial-mesenchymal transition . Further investigation is needed to solve these contradictory issues. TGF-β receptors are constitutively internalized via clathrin-dependent or lipid-raft-dependent endocytic pathways [74–76] (Figure 6). Clathrin-dependent endocytosis of the receptors has been regarded to positively facilitate TGF-β signaling while lipid raft/caveolae-mediated internalization has an inhibitory effect [77–81]. Internalization of TGF-β receptors through clathrin-dependent endocytosis to EEA1-positive endosomes is more likely to promote signaling as SARA and endofin are enriched in EEA1-positive endosomes and can facilitate R-Smads activation and Smad complex formation [78, 82, 83] (Figure 6). The internalized receptors are targeted to distinct destinations, and these processes are regulated by different Rab GTPases. The internalized receptors can be recycled and return to the membrane via Rab11-dependent manner . 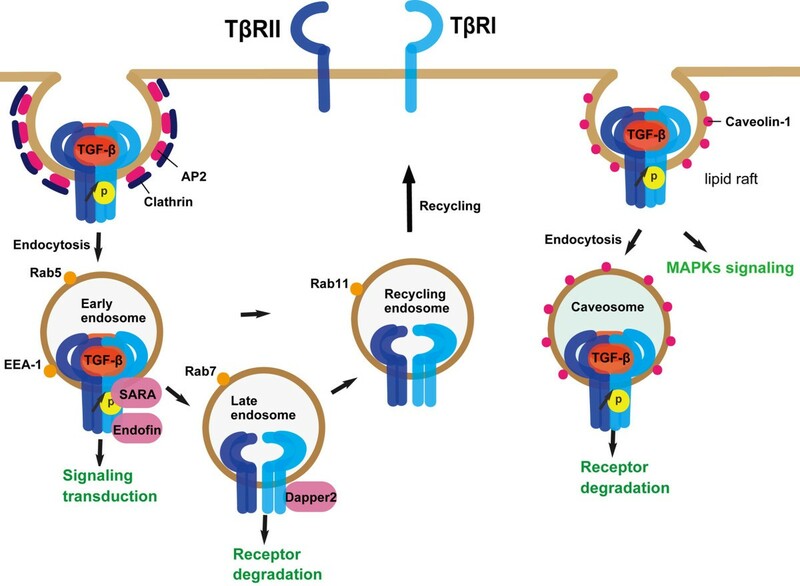 The clathrin adaptor protein Dab2 was reported to target TβRII to the recycling pathway in Rab11-positive endosomes . Once the receptors are transported to Rab7-positive later endosomes, Dapper2 can associate with activated TβRI and direct it to lysosome for degradation . Membrane trafficking regulates TGF-β receptor activity and degradation. Receptors can be directed to transduce signals, be degraded or recycled by membrane trafficking. TGF-β receptors are partitioned between the lipid raft microdomains and non-raft parts on the plasma membrane [86–91], and the partitioning has been shown to be regulated [74, 87]. Caveolin-1, a protein enriched in caveolae, inhibits TGF-β signaling by interacting with TβRI  and promotes TβRI degradation in a Smad7/Smurf2-dependent manner . Caveolin-1-mediated TGF-β receptor degradation is enhanced by CD109, a GPI-anchored protein that can function as a TGF-β co-receptor [93, 94]. Distribution of TGF-β receptors in lipid rafts does not simply promote receptor degradation, it is also required for TGF-β-mediated MAPK activation  (Figure 6). Disturbance of distribution of TGF-β receptors in lipid rafts by cholesterol depletion blocks TGF-β-induced MAPK activation and epithelial-mesenchymal transition. Modulation of receptor activity is a critical step for TGF-β signaling regulation. Although much effort has been made to understand the regulatory mechanisms of TGF-β receptor activity and stability, many questions still await to be addressed. Ubiquitination is known to promote TGF-β receptor degradation. However, its role in mediating TGF-β receptor endocytosis is unclear. Although membrane trafficking of the receptors has been quite extensively investigated, it is still far from establishment of the complete picture. Furthermore, how ubiquitination regulates TβRII is less understood, and the ubiquitin E3 ligases for TβRII are still missing. Although TGF-β receptors are found to be modified by phosphorylation, ubiqitination and sumoylation, whether the receptors also undergo other post-translational modifications, such as acetylation, neddylation, PARylation and others is still an open question. In addition to the canonical activity as a kinase, TGF-β receptors have also been suggested to have other functions. For instance, the cleaved intracellular domain of TβRI has transcriptional activation activity in the nucleus. It remains to test whether TβRII has a similar function. Moreover, it has been reported that TGF-β-mediated activation of ERK in human skins is dependent on TβRII, but not TβRI , re-raising the question whether the two types of TGF-β receptors can activate noncanonical signaling pathways independently of each other through new mechanisms. Histone acetylation has been indicated to regulate TGF-β receptor expression [97–100]. Other mechanisms may be also employed to control their transcription. For instance, microRNA mir-106b has been reported to repress TβRII expressions , and the activin type I receptor ALK4 is a target of mir-24 . Therefore, exploring the molecular mechanisms of how the TGF-β receptor activity is modulated will still be an exciting field. We thank Drs. Wei Zuo and Xiaohua Yan for critical reading. This work in YGC's lab is supported by grants from the National Natural Science Foundation of China (30921004, 91019003, 30930050), the 973 Program (2011CBA01104, 2011CB943803, 2010CB833706) and Tsinghua University Initiative Scientific Research Program (2010THZ0). FH and YGC wrote the manuscript. All authors read and approved the final manuscript.